These knives are amazing and SHARP! Clumsy me...Ive cut the same finger twice. But for cooking...they are amazing! Stocked with both Asian and Western style knives, the Henckels International Forged Synergy 16-pc East Meets West Knife Block Set has a knife to handle every kitchen task. Fabricated from high-quality German stainless steel, the fine-edge blades are perfect for precision cuts. The all-rounder 8" Chef's Knife is ideal for chopping herbs and dicing onions while the 8" Bread Knife cleanly slices through crusty sourdough. Efficiently mince garlic with the 7" Hollow Edge Santoku, whose blade has small indentations, aka grantons, which prevent food from sticking while cutting. Set includes 3" Vegetable Knife, 3" Paring Knife, 6" Utility/Sandwich Knife, 7" Santoku Knife Hollow Edge, 8" Bread Knife, 8" Carving Knife, 8" Chef's Knife, 6 - 4.5" Steak Knives (stamped), Kitchen Shears, 9" Steel, and Black Hardwood Block. Very sharp and well balanced knife set. I especially like the fact that the steak knives do not have a serrated edge. I hate steak knives with a serrated edge as they always get gummed up after a couple of cuts through a steak. 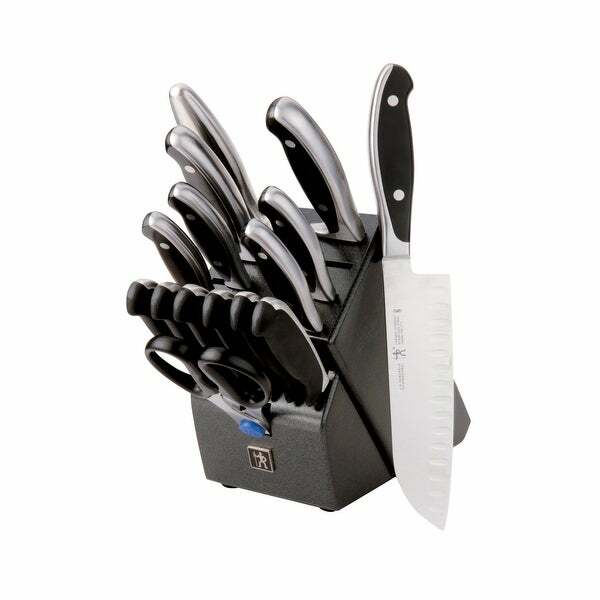 This knife set also includes more knives than most other knife sets include. Very stylish as well. They look good sitting on the counter in my kitchen. These knives are fantastic! The black and stainless match our kitchen perfectly. The blade sizes work well with how we cook and the steak knives are not too heavy. Very happy with purchase! Stylish Knife set is a delight to use! They hold their edge. I love a sharp knife when my wife and I cook as she makes me do all the prep work! Love these knives! This in the sharpest knifes I have ever owned. I would recommend these knifes to anybody who asks about them. I was looking for a new knife set and J.A. Heckel brand does not disappoint. This was the right color and sharpness that I had been looking for. I highly recommend you purchasing this for your kitchen. You will be happy! These knives are beautiful! Heavy and high quality! Nice knife set! Super sharp! Block is top heavy and may tip. Beautiful knife set. Really happy with this purchase. Cuts everything like butter!! I am truly impressed with this set! Some of the steak knives are beginning to rust. So far so good. No rust spots on the knives thus far. They are very sharp and cut well. The steak knives are really nice. Cuts right through steaks. Would recommend.